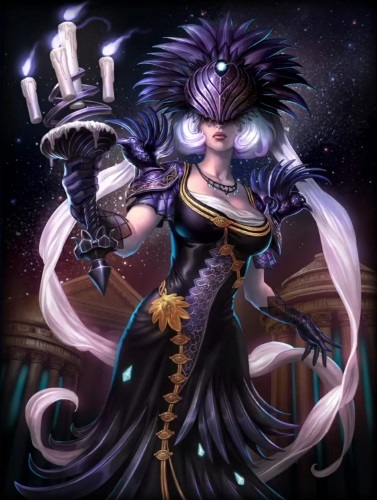 SMITE‘s Halloween Patch, aptly titled “The One Who Nox,” arrives tomorrow, bringing with it the new goddess Nox, daily login bonuses, and of course, skins, emotes, and more. Flame of the Night – Passive: Nox’s candles gather energy from all abilities used near her. For every ability cast near Nox (excluding her own) a new candle is lit. Once all 4 are lit, Nox’s next casted ability costs no mana. Shadow Barrier: Nox creates a barrier of night around herself for 1s that mitigates 50/60/70/80/90% damage from the next hostile ability that hits her. Basic attacks are also mitigated for the entire duration that the shield is up. Nox cleanses roots and slows while this ability is active. Cooldown: 20s. Cost: 70. Nightfall Raven: Nox launches a raven that spreads night along its path. Every enemy it touches takes 100/110/120/130/140 damage +50% of your Magical Power, is silenced for 1s, and is Shrouded in Darkness. The Shroud of Darkness lasts for 5s. Cooldown 15s. Cost: 70/75/80/85/90. Siphon Darkness: Nox targets the ground and attempts to consume all darkness in that area. Enemies who are standing in the target area take 80/90/100/110/120 damage +40% of your Magical Power. If a target is Shrouded In Darkness then it takes double the amount of damage. Cooldown: 3s. Cost: 50/55/60/65/70. Night Terror: Nox links her shadow with an enemy player, dealing 150/160/170/180/190 damage +75% of your magical power. While linked with Nox, enemies take damage again every time they use an ability. Nox’s ability cooldowns are also reduced by 5s every time an enemy uses an ability while linked. The link is broken by moving out of range, or after 5s. Cooldown: 90s. Cost: 100. The patch notes (accessible here) also indicate five new skins, three new voice packs, many new emotes (which can now be used in lobby), a daily login bonus for players, and balance and bug fixes. Zentia closed beta begins July 15, 2010 at 4PM (PST). The game is by ChangYou and was originally announced at E3 2010. Game Hollywood is proud to announce that their latest Anime Card/Simulation Game Robot Tactics has been featured on Google Play. The branch of 10 British light cruisers are finally ready to set sail in World of Warships.